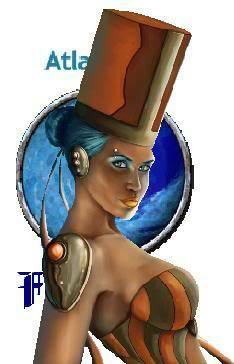 Founder of the Atlantean Foundation, she is an elf of indeterminate age and origin, and seems to be a powerful mage, having been shown respect by wide-ranging figures from Ehran the Scribe to Harlequin. She is rumored to possess some sort of ancient tome which she uses to initiate and compel the loyalty of the Mystic Crusaders, her private force within the AF. She is obsessed with the hunt for Atlantis. She is a highly-skilled mage, with a strong command of illusion spells and a noticeable, almost bardic charisma. Has used the handles Hecate and Miss Tick on various shadow-forums.